Published: May 22, 2012 at 01:17 p.m. Updated: Aug. 4, 2012 at 10:28 p.m.
ASHBURN, Va. -- Robert Griffin III strolled to the podium after his first full-squad, offseason practice, looked out at the much-bigger-than-usual crowd of cameras and immediately notified the group he'd cut in front of linebacker London Fletcher in the media-meet line. And then he said, "I hope he doesn't do anything to me afterwards." 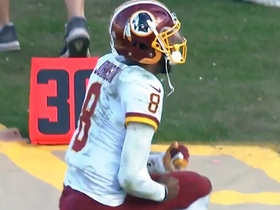 Take every word ordinarily directed at a sweetheart (swooning, starry-eyed, lovestruck) and you'll have the general response at Redskins Park to the 22-year-old quarterback-slash-savior. Kate Upton wouldn't net this many googly eyes. Fletcher, a 14-year veteran of the NFL, said he was happy Griffin was named the starter before ever taking a full-team snap. 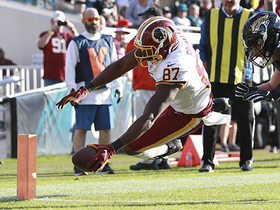 Receiver Pierre Garcon said there was nothing rookie-like in either Griffin's demeanor or his deep ball. Nose tackle Barry Cofield practically gushed about the optimism Griffin has showered on Redskins Park, and six-year veteran Reed Doughty said he's never seen a team more excited about the possibilities this kid brings. Amidst all the rookie praise, shouldn't there be a noogie in there somewhere? So no, if a rookie screamed for even a benign rookie hazing, this one isn't it. But if Griffin's going to lift this moribund franchise, he's going to need help. Obviously the on-the-field kind, as in playmakers outside (see: new arrivals Garcon and Josh Morgan), but also the mental kind, as in the stuff dispensed by Santana Moss. The veteran receiver openly said Griffin won't automatically be a redux of last year's rookie wunderkind, Cam Newton, and chafed at a parsing of his words calling Griffin "The Guy." "Don't quote me wrong. I didn't say he's going to be that 'Guy.' We got him here to be that guy. He's our guy, he's our no. 1 draft pick, he's our quarterback," Moss said. "But he has to go through the growing pains of every first-year guy." Several times Monday, Moss watched rookie receiver Darius Hanks run a route and then went over to him, slung an arm around his shoulder and talked him through something. Sometimes Moss motioned with his arm, sometimes he showed with his feet. But never did any player do that with Griffin. It's not only about corrections either, but about these kid gloves. Moss said he won't be razzing Griffin (he wants the ball) and running back Tim Hightower scoffed at the idea, too. Griffin desperately wants to impress these teammates. 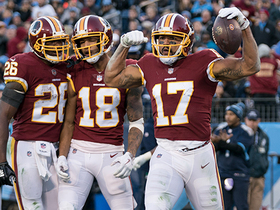 He wants to be that Redskins redeemer and he made that clear from behind that podium, saying, "When you're with the vets, it's more, 'I can help this team win.' Show them why coach has so much confidence in you." He said he feels more comfortable in the locker room than he did last week, when the veterans first arrived for conditioning. He also keeps bringing up hazing himself, joking about it, saying he's ready for it and predicting it. If not razzing, a guy like Moss has to at least offer some perspective, as he did to the media, when he said, "The one thing about guys that play this game, expectations go so far." "You have to come out here and prove yourself and this is early," Moss said. "So he has a long way to go." We can run through every horrific rookie record, from Troy Aikman's 0-11 to Peyton Manning's 3-13. Griffin will believe he can be different, and, oh boy, so do the Redskins brass that decided to put his mug on the side of their 80th anniversary bus. 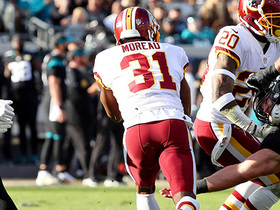 And Fletcher, too, admitting the trade that ended with Griffin coming to Washington was "a huge part" of his decision to re-sign with the Redskins. Cofield laughed at the idea of Griffin's britches ever getting big, saying everything he's read about his upbringing suggests "he's not built to have a big ego." Griffin readily said Moss and the heyday of the University of Miami "influenced" him to play football -- and he was smart enough to say first, no, Moss is not old. He smoothly joked that the Redskins putting his face on the side of a bus promised more pain than protection, and he easily dismissed a question about wearing a glove on his non-throwing hand with a clever line about idolizing Michael Jackson as a kid. Who cares if the glove's probably meant to help his grip as he goes from the shotgun to exclusively taking snaps under center? Griffin flashes his megawatt smile, the room of ostensibly hardened reporters laughs and temperance stays gone. Cofield was right: It's too hard not to like him. Still, playing for him and with him is going to take a bit more action. Like maybe some goalpost-tying.